From his first recorded solo on King Porter Stomp with the Teddy Hill Orchestra in 1937, Dizzy Gillespie projected a circus-like sense of drama on his trumpet. Throughout the 1940s, Gillespie pushed hard to stand out, co-inventing the complex bebop style mid-decade. By combining stage wit with taut musical daring, Gillespie stood out and attracted fans. He'd often climb to the heights on a solo only to scamper down in a similarly high-stakes manner, leaving audiences at the end of their seats. 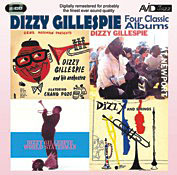 By the 1950s, Gillespie was an established jazz master, leading small groups and big bands in concert and on recordings. He was a member of the prestigious Jazz at the Philharmonic tours and led orchestras on State Department concert tours abroad. Gillespie then hit his musical peak in 1960, when he recorded two astounding orchestral albums. The first was A Portrait of Duke Ellington (Verve), recorded in April with arrangements by Clare Fischer. The second was Gillespiana, recorded in November with arrangements by Lalo Schifrin. Gillespie had exhibited excellence before these albums, of course, and would do so in the years that followed. But his playing on these intricately scored albums remains exceptional, reaching neo-classical levels. A Portrait of Duke Ellington featured Dizzy Gillespie (tp), Bennie Green (tb), Richard Berg, Ray Alonge and Joe Singer (fhr), John McAllister (tu), Robert De Dominica (fl), Stan Webb, Paul Richie, John Murtaugh and Ernest Bright (woodwinds), George Devens (vib,perc), Hank Jones (p), George Duvivier (b), and Charlie Persip (d). The songs are all by Ellington and Billy Strayhorn, but Fisher's arrangements give the jazz standards a cinematic silhouette in contrast to Ellington's yearning romanticism. There's a Gil Evans feel to Fisher's mood here—its tap-dance lightness, instrumental combinations and sighing feel. Gillespie soars throughout with perfect execution. Chelsea Bridge is a perfect example. 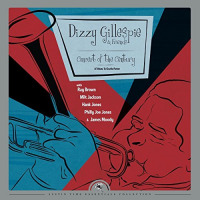 Gillespiana featured Dizzy Gillespie, Clark Terry, Ernie Royal, Joe Wilder and John Frosk (tp); Urbie Green, Frank Rehak and Britt Woodman (tb); Paul Faulise (b-tb); Julius Watkins, Gunther Schuller, Jimmy Buffington and Al Richman (fhr); Don Butterfield (tu); Leo Wright (as,fl); Lalo Schifrin (p); Art Davis (b); Chuck Lampkin (d); Candido Camero (cga) Jack Del Rio (bgo) and Willie Rodriguez (timb). In 1952, Mr. Schifrin was accepted at the Paris Conservatoire on a music scholarship. But Juan Perón's secret police [in Argentina] summoned him to find out why he sought to study abroad. 'At headquarters, during my interview, they easily could have made me disappear,' he said. 'I could hear the tango playing below to mask the screams of those they were torturing. I told the inspector that my acceptance was an honor for Argentina. He stamped my exit visa and let me go." In Paris, Mr. Schifrin played piano in jazz clubs but was nearly deported for playing without a work permit. 'A diplomat at the Argentine Embassy told me to play at a recital attended by the French Minister of Education. Afterward, the minister gave me a card to see the Minister of Labor, who granted me a work permit." In 1956, a year after the Perón regime fell, Mr. Schifrin (above) returned to Buenos Aires as a professional jazz musician—much to his parents' dismay. They feared I wouldn't be able to earn a living,' he said. When Dizzy Gillespie performed in Buenos Aires later that year, Mr. Schifrin attended his concerts and played for him at a reception. 'Dizzy asked me to come to the U.S., but I didn't receive my green card until 1958,' Mr. Schifrin said. Once in New York, he had to wait another year for a work permit from the musicians' union. 'During this time, Dizzy asked me to write a piece for him. So over a weekend I composed a draft of Gillespiana, an orchestral jazz suite." 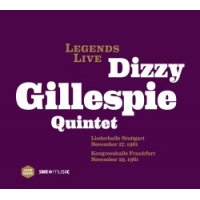 After Gillespiana was recorded in 1960 and released, Mr. Schifrin became an overnight sensation among jazz musicians, and Gillespie invited him to join his quintet on a European tour." These two albums really must be heard one after the other. One the first, Gillespie honors the Duke. On the second, Lalo honors Dizzy. 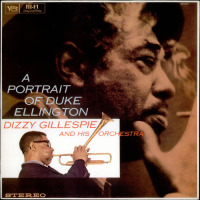 JazzWax tracks: You'll find Dizzy Gillespie's A Portrait of Duke Ellington (Verve) here and Gillespiana (Verve) here. If you love Gillespiana as much as I do, you'll find Lalo Schifrin's 1996 album of the same name with John Faddis on lead trumpet live in Cologne, Germany here.